Modern without being trendy. Gorgeous without being girly. If your woman knows style, this is the perfect gift for her! 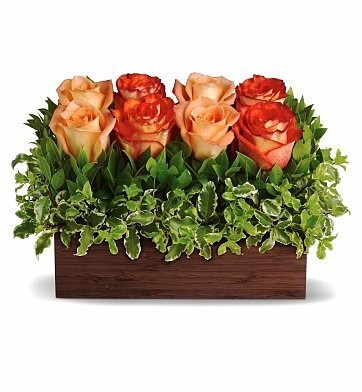 Beautifully blooming orange and peach roses are nestled in a garden of greens and delivered in a unique rectangle container. Like the prettiest of windowsill gardens, this special arrangement makes a memorable gift for any special occasion. Arrives in a stylish wooden planter box. During checkout, please be sure to indicate your preferred occasion when you choose a gift card. Exact flowers and container may vary depending upon location and availability. Uptown Rose Bouquet is a hand delivered gift. These gifts are delivered by one of our local design centers located throughout the United States and Canada. Same day delivery is available for most gifts when ordered before the cutoff time. The cutoff time for Uptown Rose Bouquet is 2 PM in the recipient's time zone. GiftTree was helpful in letting me know exactly what the difference is between good/better/best. I ordered the "better" one and wish I'd stuck with the "good" one because although the better one had more roses, it looks over stuffed in the photo my sister sent me. The gift arrived on time with just 2 days notice, so that was great. I sent this to my aunt in the hospital and she said nurses from other floors were even coming to look at this arrangement because it was so beautiful. Only problem were roses sent were not same color as pictured on line.